"...In 2010 Scotland marks the 450th anniversary of the Reformation, an event which left an indelible legacy in Scottish society. Billy Kay tells the story of the Reformation through this new seven-part series, Scotland at Prayer, detailing its effects on Scottish culture and exploring the history of the major religious identities which emerged out of it - Presbyterian, Episcopalian, and Roman Catholic. In this first programme Scotland at Prayer, examines the period of the Reformation itself, and the visionary nature of some of the innovations introduced by Knox and Melville. It also counters some of the myths, and discovers for example that John Knox was a claret drinking ladies' man who was regarded as one of the country’s first linguistic anglicisers. Later in the series Scotland at Prayer, will explore the emergence of Evangelicalism in the Highlands in the Free Church and Free Presbyterian Church, and the survival of the tradition in Lewis. The story of other churches with a long pedigree in the country will be told - the Quakers, the Methodists, the Baptists and the Brethren - recalling the great religious revivals which swept through Scotland and the cultural forces which led to the spread of Brethren and Baptist churches in places like Ayrshire mining villages and fishing communities on the Moray coast. Scotland at Prayer, celebrates the history of the churches, the faith of the people who belong to them, the local and national identity of their adherents, their influence on politics and culture, the effects of immigration, and the tension between the values of the past and the society of the present. For a majority of Scots, knowledge of other churches can be scant and based on stereotypes. This series will reveal the deep historic roots of all of the major Christian denominations in Scotland and explore their relevance to the future of the country..."
It'll be interesting to hear how the subject matter is handled. Part of me suspects that the Reformers (as usual) will be portrayed as iconoclastic vandals and dour-minded killjoys. 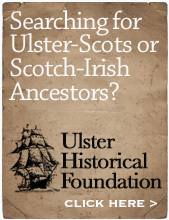 I also suspect that Ulster will be a footnote, if we're even mentioned at all. Let's hope I'm wrong. Just back in from Donaghadee, me and the two boys along with Andy Adair. Three fishing rods between us and landed a colossal 60 fish - mostly good sized mackerel and lythe (pollack), with some blockan (coalfish / coley) and one wee herring forbye. We just kept a dozen of them, the rest were thrown back in. It's hardly in the same league as the account of Jesus and the "great draught of fishes" from Luke chapter 5, but it's as close as we're ever going to get to it. Seafood barbecue tomorrow! In between these dates, I'm delighted to have been asked to be tour guide for a coach tour of the Ulster-Scots History of the Ards and North Down. This is being organised by Loughries Historical Society, from 9.00am - 1.00pm on Saturday 2nd October. There will be just 30 seats available. 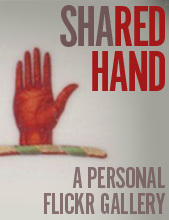 More details on this to follow. "Meeting House" is usually a name associated with Presbyterians. This photograph, of the church in Portadown that my uncle Harvey Shaw is pastor of, shows that it's not limited to Presbyterians. In Greyabbey there's an old street sign for "Meetin Hoose Raa". As a name I like "meeting house" far better than "church", because the word "church" is meant to refer to a group of people, not a building. I'm sure somebody out there can tell me a bit about the history of the term. I was down that way a few weeks ago, and on the road into Banbridge (Dromore Street to be precise) I noticed a cluster of streets with good Ulster-Scots names, like Burn Brae Court and Burn Brae Green. There may well be more like that. In the main, the incoming Scots settlers of the 1600s were happy to retain the existing Irish townland names, but introduced Scots names for smaller areas within the townlands. There's a project in there somewhere, to map all of those smaller names - however, many have never been "officially" recorded on maps or surveys and so they only remain in the memories of the older generation. The libraries and archives will (in theory) always be there, but the people with the unrecorded knowledge will pass away. I was with two architect friends today, both of whom have won RIBA awards for their work, and who also share my love of rural vernacular Ulster. There aren't many folk today who know who Estyn Evans is, never mind architects who actively seek to integrate the folk customs Evans wrote about into their clients' buildings. Below are some photos that prove to me that tradition can be retained and honoured in a way that's relevant to today. There's no need to bulldoze heritage and import influences from afar - we have so much right here already that we should value more. 20 years ago, when I left school back in 1990 I had offers to go to art college either in London, Glasgow or Dundee, but decided to stay in Belfast. At the time the staff at the University of Dundee interview said that 1/3 of the students in the city were from Northern Ireland. Just last month, having flown from Northern Ireland to the south coast of England for our holiday in Devon, I met a retired ex-RAF man whose father had grown up on a farm just a few miles away from the one I grew up on. The British Isles are small. One of the things that becomes clear when you travel within the British Isles is the huge amount of integration there is among the general population. The five main jurisdictions - England, Scotland, Wales, Northern Ireland and the Republic of Ireland - aren't as alien to each other as some politicians and commentators would have you believe. IRELAND: Northern Ireland & the Republic of Ireland There are about 6 million people on the island of Ireland. As if by magic, there are 6 million Irish-descended people resident in GB who are entitled to Irish citizenship and Irish passports. SCOTLAND 20% of the present day population of Scotland are said on this Wikipedia page to be of "Irish (either Protestant or Catholic) heritage"; that's about 1 million people. But close to the same amount - over 800,000 - of the present day population migrated southwards from Scotland into England and Wales (source here). In previous generations I suggest that that figure would have been much higher - meaning that a lot of English-born folk in fact have Scottish parents or grandparents - but this isn't recorded on any census so there are no stats available. WALES A quarter of the population of Wales weren't born in Wales (that's about 750,000 people, the majority of whom were born in England) - with more or less the same number of Welsh-born folk living in England. The idea of devolution - a bit of regional responsibility away from centralised London government - is in my view a good thing in that it should enable policies to fit with local differences within the regions. But when politicians use their wee devolved fiefdoms (whether Oireachtas,Assembly or Parliament) to build walls of division and nationalism they do so without any sense of the benefits of how connected the people are. The populations of the five "home nations" are deeply interwoven through the centuries-old whirlpool of internal migrations that continue right up to this generation. Yes, a live action TV version of the Broons (not an animation) is on the way. it could be absolutely dire, or brilliant. The programme makers, Baby Cow Productions, are one of the UK's major comedy factories and are planning a one hour pilot as a test. We got Broons annuals every Christmas when I was a wee fella; I remember back in 2006 or 2007 buying a copy for each member of an organisation I was involved in at the time, but only two of them had ever heard of the Broons! If you've missed it, be sure to get over to Aiblins.com to marvel not only at MrUlsterScot's generally successful stream of live blogging posts from last Saturday's RSPBA World Pipe Band Championships, but also the resilience and reserve he has shown in being badly let down by Easyjet. A few years ago I had a similar experience of dire customer service with them and had to stay overnight with my fraught wife and weans in an airport hotel in Luton - at our expense! I came home and registered the web address www.lousyjet.com, but did nothing with it in the end. MrUlsterScot writes, and photographs, very well. Hopefully his much-vaunted video clips will be worth the wait! Well done to all of the Northern Ireland bands who did so well at the Worlds, and to the ever-energetic David Scott (Secretary of the RSPBANI) who managed to get a slot on Good Morning Ulster earlier today to gloat about the well-deserved triumphs! "Unfailing courtesy, kindness, tenderness and consideration for others are some of the greatest ornaments to the character of the child of God. The world can understand these things if it cannot understand doctrine. There is no religion in rudeness, roughness, bluntness, and incivility." Thanks to Sharon Stewart Wilkerson for this great quote. It's been all over the media this week that American writer Anne Rice has "...quit Christianity and being Christian...". She said “I remain committed to Christ as always but not to being ‘Christian’ or being a part of Christianity. It’s simply impossible for me to ‘belong’ to this quarrelsome, hostile, disputatious, and deservedly infamous group.". Jesus is the whole point of Christianity, not denominations or buildings, not financial contributions, not whether your family have been part of a particular congregation for many years. In fact, it's not even about what are sometimes called His "teachings" as if He were just a wise man. Jesus is not simply an example who shows us how to live a moral life - in fact, the reason the He came, died, and rose again was because people could never live truly holy lives. He demands far more than to be a template. He is Creator (John ch 1), He is the expression of the love of God (Romans 5v8), He is Redeemer (1 Corinthians 15v3), He is Advocate (Romans 8 v 34), He is returning King (John 14). He is not one of a number of options, He is absolutely unique (Acts 4v12). One of the trends of recent years has been the "packaging" of culture, usually urbanised Belfast stuff, which is assumed by its' packagers to also apply to rural market towns of Ulster and so is then exported to those places with little consideration or thought. Following the Ulster Workers Strike of 1974, those towns were infected by the more unsavoury aspects of Belfast life due to the big population shifts and subsequent housing estates that were spawned by "The Troubles". In most cases this catastrophic Housing Executive policy didn't dilute the paramilitary influence but spread it wider. We all know too well the estates of Newtownards, Bangor, Dundonald, Lisburn, Carrickfergus, Glengormley, Antrim and Ballymena which suffer still. These "mercat touns", and many like them, are mostly - historically at least - Ulster-Scots and so they have their own histories, stories and vocabularies. The song below was given to me many years ago by the late George Holmes (to give him his full title Dr George Holmes MBE, PhD FIPSM [Bel], FSA Scot, FHS [GB&IRE], FIHC, MICTM). He and I spent a cold night in the directors box at Windsor Park and talked about songs and local traditions throughout, not really paying attention to the match. It is sad that George passed away earlier this year - he had much knowledge accumulated and was generous to me with much of it. This oul Newtownards song he gave me, called "The Harvest Fair", is a simple telling of what was once the big date in the annual calendar. It also marked the date when blackberries had to be picked - any picked after Harvest Fair day were likely to be full of wee worms. Nae use for making jam in a pillow case - but that's another story, and who makes their ain jam now anyway? The spellings are as they were given to me, but it's easy to imagine that these have been "English'd" over the years and that the original version would have been a much fuller Ulster-Scots. My favourite part is where the oul farmer, even back when this was written maybe 70-odd years ago, was unimpressed by the state of the Fair and that it was no longer as good as it once had been. Some attitudes never change. The last big local piping event is the North West Championships in Portrush on Sat 21 August beginning at 12 noon. I've spent a few late nights recently with my two boys doing a bit of pier fishing. We usually get there about 9pm (dusk at this time of year), and so far we've caught a load of lythe (English name - pollack) and blockan (English name - coalfish), with other local sea anglers telling us that they've managed to get rare varieties like cuckoo wrasse this summer too. Last night the clouds rolled away and the stars came out, so we stood fishing in the dark looking up at the Plough and other constellations. All good male bonding stuff, and the things that (hopefully) the boys will remember for the rest of their days. Have you noticed how the accents of most Northern Ireland broadcasters are far more Anglified than ever before? What was once a James Young joke about the posh people of "Cherryvalley" is slowly becoming an everyday experience on the local media. Maybe it's just that I'm longer in the tooth now and tend to notice these things, but (and I'm doing my best not to name names and get into trouble) there are particular local broadcasters who nowadays sound far more English than I ever remember before. Now, as many of you know, my wife is English, and "being convinced" of the merits of Unionism (I hope you picked up the source of that reference in bold), I have absolutely no problem with English people speaking with English accents. Or Northern Ireland folk who have spent time away from here and return with a hybrid accent. What gets my goat is Northern Ireland folk denying their own roots and pretending to be English, or even Anglo-Irish, in their speech. Fiona touched on similar themes in this recent post on her blog. How-now-brown-cow, softened "r"s, "eight" being pronounced as "ayt" instead of "ee-it", even a simple inoffensive word like "well" has the vowel softened to become a kind of "waaaal"... just listen to your radio and tv tomorrow, particularly the current affairs coverage, and you'll hear loads of examples of this. The vast majority of Northern Ireland folk I know don't talk like this, so why do broadcasters feel that they need to? Perhaps it's a sign of a major class divide? Does everyone who lives in a posh place speak with a posh accent? Does it come as a package along with the three cars, the Donegal weekend hideaway and the annual holiday in Tuscany / Lake Garda / this year's fashionable destination? If it's not okay to speak with a fairly standard Northern Ireland accent (I know there are varieties within Northern Ireland, but you know rightly what I'm generally talking about) then what chance is there for the next generation to ever hear, or feel a fondness for, the simplest elements of Ulster-Scots vocabulary and speech? When did you last hear "Aye" for yes or "wee" for little on mainstream UTV or BBC programmes - except from listeners who had phoned the show and were on air? Sim leowcahl broadcahstaahs seem to think thet they operayte on a raatha highaa playne then the rist of us meeah moahtils. Here's a similar post from 18 months ago. Had the pleasure of seeing two of the world's greatest pipe bands - Field Marshal Montgomery & Simon Fraser University (Canada) in action last night on the stage of the Waterfront Hall in Belfast. A superb night and an ideal curtain raiser for next weekend's RSPBA World Pipe Band Championships in Glasgow. Field Marshal Montgomery have set themselves a target of raising £2500 over the next ten days for Breast Cancer charities, with all profits from merchandise being donated. To buy some, visit their website. Thanks to the RSPBA for sending me two front row VIP tickets, which had me sitting between their Chief Executive, Ian Embleton, and their President, George Ussher. George is already brewing some thoughts for a similar, but even more innovative, concert for next year. As we left at the end, Nelson McCausland was buttonholed by a wee woman who said to him "we've travelled from Fermanagh to be here tonight - and we want more of these!!". Photo © Jim Mayne, of Jock Troup leading a children's mission, circa 1920. Thanks again to Jim Mayne from Bangor for lending me some of his old 78 collection some weeks back. I have digitised these and cleaned up some of the crackle; they have now been incorporated into the Scottish music archive RareTunes.org. Jock Troup (1896 - 1954) was a very famous evangelist of his generation and spent much time preaching in Ulster. He is only known to have ever recorded two songs - "He Did Not Die In Vain" and "Unanswered Yet" (Beltona 1584). In 2002 George Mitchell wrote an excellent biography of Jock Troup entitled Revival Man - The Jock Troup Story. Recently, Sharon Wilkinson from North Carolina also sent me a biographical booklet by her father, a preaching colleague of Jock's called James Stewart, entitled Our Beloved Jock - Revival Days in Scotland and England - the Story of a Fisherman Revivalist. 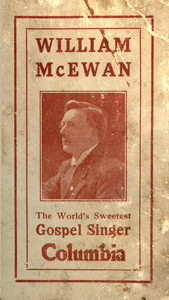 Duncan McNeill / M'Neill (not sure of dates of birth or death) was described as "Scotland's Sweetest Gospel Singer" and "The Scottish Skylark", and for a time was also pastor of Bridgeton Baptist Church in Glasgow. Among Jim's 78s were two by McNeill - "Thou Remainest" & "Will the Circle Be Unbroken" (Beltona 1460) as well as "Don't Be Downhearted" & "The Gospel Ship" (Beltona 1620). I am not sure if he spent any time on this side of the water, but his records and his hymn book were certainly enjoyed here. Any information you might have about him would be appreciated. With Jim's permission all of these tracks have been sent to Stuart Eydmann who runs the website RareTunes.org, to add to his collection there. RareTunes is an excellent growing archive of rare Scottish recordings. Troup and McNeill, along with others like Seth Sykes, Charlie Mayne, W.E. Tocher and many others were all Scottish preachers who made a big impact on Ulster in the early 20th century. Another great example is the "Old Tent Evangel" which was founded in 1922 and moved around different areas of East Belfast - it was nicknamed "The Cloot Kirk" (the Cloth Church). In addition to their spiritual legacy they also left a collection of songs, hymns and childrens choruses, some of which used Scots language words and expressions. Perhaps the close relationship of the Belfast and Glasgow shipyards was a factor, but these are all evangelical evidences of how Scots speech was once a frequent feature of the working class life of Belfast. NB again - Jock Troup's understudy / successor as Glasgow's most renowned open air preacher was Raymond McKeown. His parents, Joseph and Margaret McKeown, were Ulster folk - Joseph had been in the Army and the Royal Ulster Constabulary but they moved to Glasgow in the 1930s because of the threat of terrorist attack on the family. This is a detail from an old 78 record sleeve loaned to me recently by a friend from Bangor called Jim Mayne. Maybe someone out there can guesstimate the date from the four digit phone number? Belfast was one of the first 13 local authorities in the UK to be permitted to install its own local telephone system in 1899. I expect that this might well have been one of the shops who sold old hillbilly and American gospel 78s to my granda and his generation. Nowadays the address is occupied by the consultancy firm ASM Horwath, who I've done some work with in the past. BBCI's "The One Show" last Tuesday included a short 4 minute film about the famous Hebridean slaves who were landed at Donaghadee and were freed. My good friend Bill Montgomery, and Donaghadee historian Harry Allen, both featured in the piece. It's just been removed from the iPlayer this evening, so I hope you got to see it before it went! If not, here's a summary of the story. Harry Allen's excellent book on Donaghadee includes a lot of detail of the story as well as photographs of some of the sites and buildings.